Is Patricia Butenis without scruples? 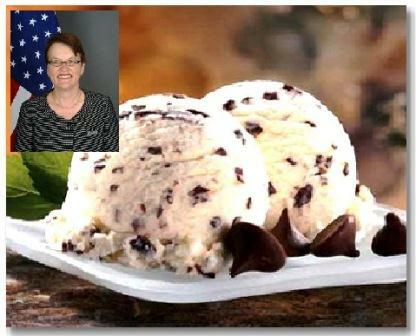 .. the first time we met properly, she sent me chocolate chip ice cream .. The short answer, I suppose, is that I do not know. I would hate to think she was, for about the first time we met properly, she sent me chocolate chip ice cream, and someone of such sensitivity cannot be all bad. It was brought to me by one of the nicest people in her embassy, one who finally told me that the embassy did have some very peculiar people in it. Being a loyal and professional diplomat, that was the furthest he would go, but it brought home to me the systematic schizophrenia, not only of the American Embassy in Colombo, but of their foreign policy in general. 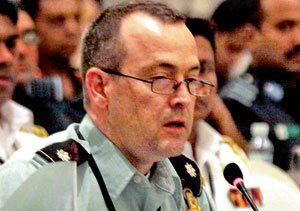 A few months later, the much publicized comment of the Defence Attache in Colombo, which led to him being in effect reprimanded by the State Department in Washington, provided the frosting as it were on that particular cake – and his assertion that he knew he would get into trouble when he spoke made clear that there are at least a few straight people left in those hallowed halls. What then is the problem with Ms Butenis? I raise this question now publicly because the Secretary of Defence has finally brought into the open what I can only call disgusting behaviour by at least one American diplomat. I mentioned this some months back, which brought what purported to be the lady’s deep indignation on my head, duly reported in the newspaper group which also leaked another State Department barrage recently. The report about me then claimed that I was to be boycotted by two embassies, but this turned out to be false, though one possible suspect did tell me that the Americans may have made the claim on their behalf without actually keeping them informed. And Ms Butenis indeed was gracious enough to say I could continue to speak to her staff, many of whom I believe belong to that idealistic school which lulls one into affection before the Ugly Americans so splendidly described by Graham Greene and John le Carre take over. But I don’t think she was pleased when, the last time we spoke – in fact in the office of the Defence Secretary, whom her colleagues seem determined to demonize – I told her that I thought her chief agent of wickedness was Pavlovian in his approach to Sri Lanka. I was referring to Paul Carter, whom I would not describe as evil because I do not think he is actually capable of moral responsibility. Someone who tries to suborn the generals of a supposedly friendly country really is totally beyond the pale, though I suspect that is not the only reason he reminds me of the Anthony Perkins character in ‘Psycho’. On the occasion I was referring to, a party for those who had been on Visitor programmes to the United States, he had burst out into indignation about the treatment of his hero Sarath Fonseka, with concomitant insults about our judiciary, to a lady whose interests were in language training. The American Deputy Head of Mission had tactfully taken him away quickly, but I have no doubt something else would soon have triggered the same sort of reaction, in someone whose moral sense has deserted him, to be replaced simply by not entirely metaphorical foaming at the mouth. His inordinate concern about Sarath Fonseka is what has convinced me that, towards the end of 2009, something very pernicious took place in Foggy Bottom, or wherever it is that the more devious American diplomats make policy. A short while previously, Carter himself had told me in very measured tones about a State Department report that I found fingered Fonseka as the most suspicious element in what were presented as potential war crimes, but put together in a very civilized manner that seemed to invite a civilized reply. Not for the first time, I must say that I believe we blundered in not responding immediately to that report, and I continue bemused at the continuing lethargy of those to whom the President entrusts crucial tasks. For, soon afterwards, Fonseka became the darling of the West, or rather of the Americans and the British – whose attitudes indeed astonished some of the Europeans with whom I discussed this, one of whom baldly stated that of course they knew exactly what Fonseka was. The British, normally much more subtle, I could understand playing games in the Miliband – Peter Hayes period, though thankfully that is an aberration I believe will not be repeated, at least in the short term. But why were the Americans so peculiar, given that Bob Blake, at least in my book, had been a sensible man who, while deeply and I think rightly worried about attacks on journalists, had generally been positive about our efforts to eradicate terrorism on our shores? Bob had told one of my friends who asked about what seemed a different approach in 2009 that he served a different administration, but nevertheless I think he would not have betrayed all principles blindly to serve masters less knowledgeable than himself. Sadly, I suspect that, while those involved in preparing the Kerry report on relations with Sri Lanka were moving towards a more balanced view, the hardliners in Washington hit on the expedient of winning over unscrupulous military men, a tactic that the West (along with the Communist world, no doubt, though the latter seem to have been less crude about this) had indulged in for decades, vide Ayub Khan and Idi Amin and Mobutu and Pinochet and Suharto and so on and so on and so on. And so Sarath became the chosen instrument of regime change, which even last year some diplomats in crucial positions in the West were advocating, though the one who put it to me as well as to the Governor of the Central Bank, on a different occasion, couched it in very civilized, almost philosophical, terms. On balance, indeed, I think the British and the Americans assumed that Sarath would hand over power to Ranil Wickremesinghe as he had originally promised, and be content with a ceremonial role. Doubtless they would have thought they had ways of dealing with him if he reneged on his commitments, which is presumably why the perceptive BBC man in Delhi told me that the first person Sarath would have killed would have been Ranil. But that is another story. The upshot was that Sarath lost, and lost badly, and it was clear that the people of this country were not in a mood for regime change. Ms Butenis I believe, having been sent out at the height of the Obama Administration doubts about Sri Lanka, along with Paul Carter and several others, then began to understand a bit more about Sri Lanka, being more perceptive than Mr Carter, and actually began to work more in accordance with the example Bob Blake had set, with his totally positive heads of Aid and Public Affairs. What then changed? Something certainly went wrong in the course of 2011, and we have again efforts to undermine the government, most obviously the effort described by the Secretary of Defence to suborn a serving General. This is accompanied by leaks that purport to cite servicemen, whereas a quick glance at the historical record would make clear that all those in positions of influence during the military operations have remained true to their country, save only for Sarath Fonseka. However those who listen to sound bites do not know that, and do not care, so that reporters provided with leaks by conniving officials are able to traduce the country with no question of substantiating what they say. In parenthesis, I should note that some government spokesmen have also contributed to this situation, where wild allegations are treated seriously, by their unthinking response to Sarath Fonseka’s initial charges. Looking back now on the whole episode of the ‘Sunday Leader’ interview, it is clear that government made a mistake in not dealing with what the ‘Leader’ said in the light of what the State Department report cited Fonseka as having said in Ambalangoda a few months previously. He was cited then as having said in effect that he had ignored orders to spare those carrying white flags, because he knew what such people had done. Government should then have responded by declaring, with the State Department as a collaborative source, that Fonseka was a liar who changed his story at will. This did not prevent them characterising him as a traitor too, but in their anxiety to do this, for electoral reasons, they ignored the long term effect of such a simplistic rebuttal. 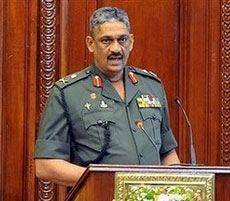 The impression given to the world was that Fonseka had been wrong to say what he had said, regardless of whether it was true or not, whereas the stress should have been on the fact that his own words earlier, highlighted by the Americans themselves, indicated that it was not true, and that he was clearly willing to say different things to please different people. So we allowed Fonseka to masquerade as the good guy, with government wanting a cover up, whereas a proper inquiry into that incident would have suggested what D B S Jeyaraj indicated in his thorough account that appeared in January 2010. Similarly, investigation of allegations with regard to hospitals – which were also mentioned in the 2009 State Department Report, but with a disclaimer to the effect that a hospital alleged to have been hit was still standing when satellite images were obtained later on – would have made it clear that government did its best to avoid civilian casualties, even while dealing with the heavy weaponry the LTTE had drawn up near to the hospitals. The attitude that civilian casualties did not matter was the Fonseka approach, whereas the Secretary of Defence, and the elements in the army that Fonseka had sidelined, such as the present Army Commander and the present Chief of Staff, always did their best to avoid civilian casualties – indeed one of the first briefings I had, when I took over the Peace Secretariat, was from General Ratnayake to explain how civilian casualties had been avoided in the retaking of the East. Though I am not sure that Fonseka would have thought up such a strategy himself, I would suggest the one-sided reaction to his interview with the ‘Leader’ in a sense boxed us in. I myself believe, with I think more evidence at my finger-tips than most for I monitored the war throughout and I still have records of the paucity of allegations regarding civilian casualties even on TamilNet for much of the war, that we fought much more cleanly than any other force combating terrorism. If there were aberrations, it would be by a few individuals, of what might be termed the Fonseka mentality as evinced by his statement in Ambalangoda. But we seem to have cut off the option of looking at these since we could then be accused by Fonseka of being traitors ourselves, to the great ruthless war hero he was initially casting himself as, according to what the Americans cited as to Ambalangoda. And so we have to put up with rogue anonymous imaginary generals being cited, while Paul Carter runs around trying to suborn real ones too. As with terrorism, we know that it does not matter if they fail all the time, they have to be lucky only once, to get what they want. Sadly, at the time Paul Carter first revealed himself, our Foreign Ministry did not call in Ms Butenis and ask her what was going on. At the time, I would myself have thought, Ms Butenis would not have been a party to what was going on, and dealing with her on positive and collaborative terms would have been quite feasible. But, like most monstrosities, promoting treachery is an appetite that grows in the feeding – and that is why I now fear for Ms Butenis’s immortal soul, since I have no doubt that, possibly unlike Paul Carter, she does have one. Exploring that, however, requires another essay.